Cities around the world are pursuing a smart cities agenda. In general, these initiatives are promoted and rolled-out by governments and corporations which enact various forms of top-down, technocratic governance and reproduce neoliberal governmentality. Despite calls for the smart city agenda to be more citizen-centric and bottom-up in nature, how this translates into policy and initiatives is still weakly articulated and practiced. Indeed, there is little meaningful engagement by key stakeholders with respect to rights, citizenship, social justice, commoning, civic participation, co-creation, and how the smart city might be productively reimagined and remade. 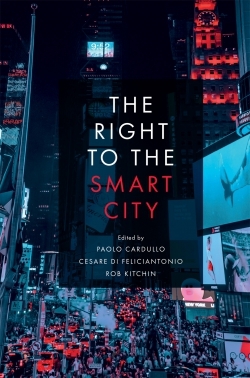 This book fills this lacuna by providing critical reflection on whether another smart city is possible and what such a city might look like, exploring themes such as how citizens are framed within it, the ethical implications of smart city systems, and whether injustices are embedded in city systems, infrastructures, services and their calculative practices. Contributors question whether the need for order, and the priorities of capital and property rights, trump individual and collective liberty. Ultimately considering what kind of smart city do individuals want to create, and how we create the most sustainable smart urban landscape. Dr. Paolo Cardullo is a Postdoctoral Researcher at The Programmable City at NIRSA, Maynooth University of Ireland. Dr. Cesare Di Feliciantonio is Marie Curie Research Fellow in the School of Geography, Geology and the Environment, University of Leicester, UK. Professor Rob Kitchin is a Professor in the Maynooth University Social Sciences Institute, Ireland and Principal Investigator of The Programmable City and Building City Dashboards projects.